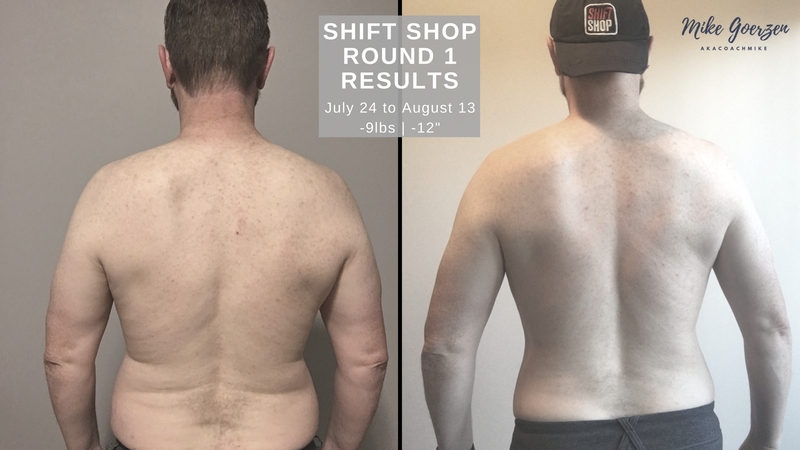 On July 24th, 2017 I did my first round of Beachbody’s new program: Shift Shop. My mind. Is. Blown. Who would have thought that in just 3 short weeks a person to both see and feel such amazing changes. 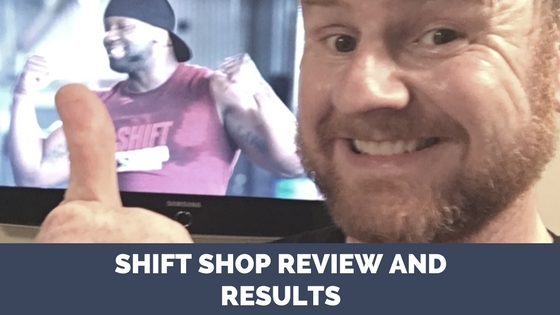 This is my review of Shift Shop as well as a summary of my Shift Shop results. 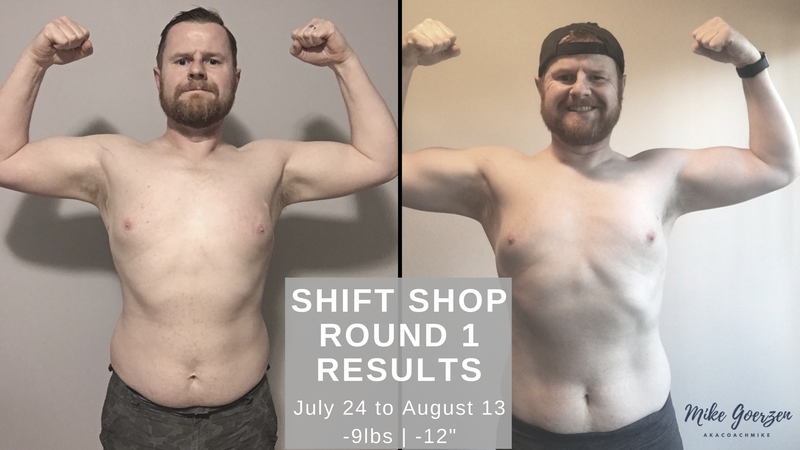 Shift Shop is a 3 week program. Each week, the workouts ramp up in length and intensity. At the same, the nutrition plan changes week by week. And throughout, Chris Downing is motivating and encouraging us to get better. For nutrition, this week offers a fairly standard “clean eating” approach. Lots of veggies, fruit, and protein. One difference between this plan and others that Beachbody has offered is that there are no grains in the plan. No rice, no whole wheat bread, no quinoa. Instead, your carbohydrates come in the form of things like sweet potatoes, beans, as well as all the veggies and fruit. I knew going in to the program that my body responds well to reduced carbs and elimination of grains. So I had no struggles at all with the plan’s approach. Week 2 sees us working out a bit longer each day. Workout length increases to 35 minutes. The structure of the week is the same as week 1: we alternate Speed and Strength workouts. And, we add in that same core routine twice. On the nutrition plan, we start to eat more veggies, protein and healthy fats, and fewer fruits and carbs. We’re slowly transitioning our bodies away form using carbs as an immediate fuel source. I’ll be honest: I hit a wall in the middle of the week. But I knew that was a wall that represented a barrier to achieving my goals. Chris even said in one of the workouts that the results we want are on the other side of that wall. It was like he was reading my mind! The final week! 45 minute workouts, and they are no joke! But Chris does a great job of keeping us motivated. The nutrition evolves again, with even more veggies and protein, and less fruit and carbs. We’re now really tapping into our fat stores for energy to get through the workouts! This week was all-out effort. This was the most I have sweated since I did Insanity: The Asylum back in 2013. And yet it was still so much fun and rewarding to do each day. I followed the plan exactly. No cheat days, no skipped workouts. And I was really happy with my results. Overall, I lost 9lbs and 12″. I did this program with several others, and these results are really typical. So I’m not an outlier! It’s also important to note what my starting point was. I wasn’t sedentary with a poor diet. I was already working out hard, eating well, and hydrating. So those 9lbs were not the “water weight” that we often see absolute beginners lose. Bottom line for me is that I love this program. We sometimes talk about having a “soulmate” workout, and I think this is the one for me. I’m moving on to round 2 (where we add in the bonus 50 minute workouts! ), and will probably do additional rounds. This program is suitable for anyone that wants to lose weight or improve their athletic performance. And beginners shouldn’t be scared: each move has a modifier. So unless you have an injury that prevents you from working out, this program will likely work for you! Ready to make the Shift yourself? Contact me to find out when I’m running my next Shift Shop accountability group.